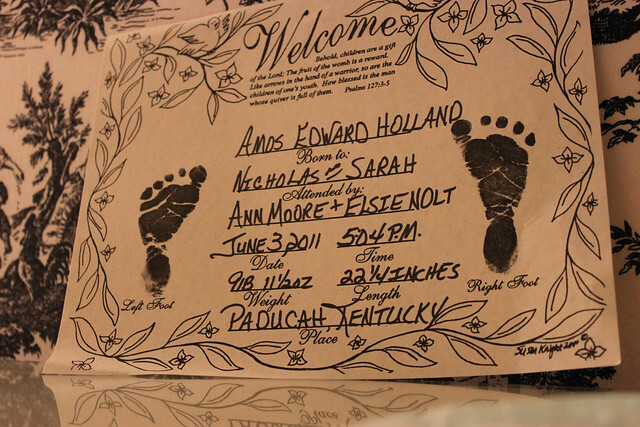 Recently, I was talking to two close friends about birth options in the Louisville area. Apparently, most women who would like to give birth with the assistance of a midwife and avoid an increased risk of medical intervention take the bridge across the river to Indiana. "That's not an option for me," I told them. "Why not," my friend asked. "Because my child has to be born in Kentucky." They insisted that their children were still Kentuckians really. They argued it doesn't really matter where you were born. Maybe for some but not for me. Both of my children are ninth-generation Kentuckians. For over two hundred years, almost every branch of my family tree has grown tall and strong in the fertile soil of Western Kentucky. Kentucky is in my blood. Kentucky Born & Breaded Onesie via Kentucky for Kentucky. I know it might seem silly or antiquated but I do believe there is a certain magic to the place of your birth. Not that you can't make another place your home. I first visited Washington, DC, when I was in middle school and my best friend remembers me saying dreamily, "I want to live here one day." And I did. And it will always hold a very special place in my heart. But where Washington, DC might hold a little piece of real estate there, Kentucky has taken over every remaining crevice and corner like kudzu. Deep down, I hope the state holds the same draw for my boys. I want them to grow and explore and travel all over the world but then - if I'm being honest - I'd like them to come home. Every time someone asks where they are from or where they were born I hope the answer draws them closer. "I was born in Kentucky."